Interview with Mohammed Al Malki, the Omani track star. | Helping the best to get better! Phil Zimbardo, in his book The Time Paradox, wrote about the time perspective of humans. Some people prefer to live in the past, some in the present, others mainly look forward towards the future. I like to learn from the past in order to have a better perspective on the future. I just came back from a fantastic holiday in the country where I used to work ( 1990-1992), the Sultanate of Oman. The best athlete I coached over there is Mohammed Al Malki, a wonderful person and a great athlete. Olympic finalist in 1988 at the 400 meter and winner of the Asian Games in 1990, with a personal best of 44.56 secs, a time that still stands. So meeting with him again and looking back after 28 years, I took the opportunity to interview him during a long car ride into the countryside of his beautiful country. First of all because he was a remarkable athlete whose times still stand. His 44.56 seconds would have gotten him a 4th place at the last World Championships in London! And of course because I know him personally, and it was a good opportunity to interview him. Mohammed Al Malki started athletics at the age of 21, in 1984, the Olympic year. Before that he used to play soccer and was rather good at that too. His first competition result was after a few weeks when he ran 400 meter in 49 seconds. His first international experience was when he was allowed to represent Oman at the Olympics in Los Angeles in 1984 and as matter of fact his first international competition was the heats of the 400 meter at the Games. Just before that, he spend 45 days of training with an US coach track and field coach, Sam Bell in Indiana. He was 6th in the heats in 47.61 secs, still being tired of the training. In 1985 he won the first ever medal for Oman (silver) at the Arab Games. In 1986, he started training with a British coach Tudor Bidder, who came to Oman and in that year he won the bronze medal at the Asian Games in Seoul. He stopped training for a few from time to time due to injuries or lack of motivation, only playing soccer again. 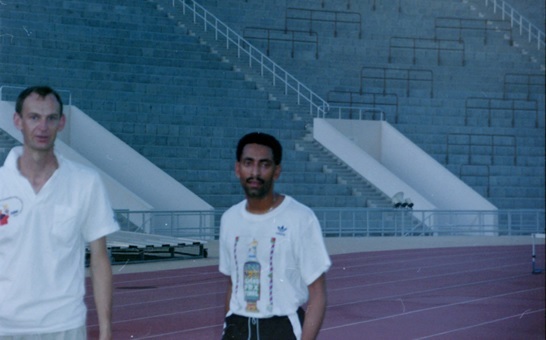 In 1987 Mohammed won medals at the Arab Championships in Algiers, the Asian Championships in Singapore and also went to the World Championships in Rome, and made it to the quarter final (45.71 secs). His best year was 1988, when he was finalist in the Olympic 400 meter final at the Seoul Olympics and also ran his best 400 meter time of 44.56 in Budapest. He spend quite a long time abroad for training camps and competitions, in Australia and Germany. (Note: during the summer months of June, July and August the temperature in Oman can rise up to 50 degrees Celsius (122 F) which makes it impossible to train during daytime. Also quality competitions were lacking in Oman and the Middle-East). In 1989 Tudor Bidder left Oman, I came at the beginning of 1990. I worked in Oman from 1990-1992. Unfortunately Mohammed was suffering from an injury in 1989 and his motivation was rather low. The injury was a thigh injury caused by a contusion in the thigh muscle, during a soccer game, leading to hematoma that calcified, called myositis ossificans. But thanks to Mohammed’s willpower we were able to prepare him adequately for a new challenge, participation at the 1990 Asian Games in Beijing. But disaster struck, two days before the competition Mohamed pulled a hamstring muscle during a very easy 250 meter in approximately 30-31 seconds. Diagnosis by ultrasound showed a serious lesion and non-participation was looming. Even walking became difficult. Not willing to give up yet, we decided Mohammed should run none the less. 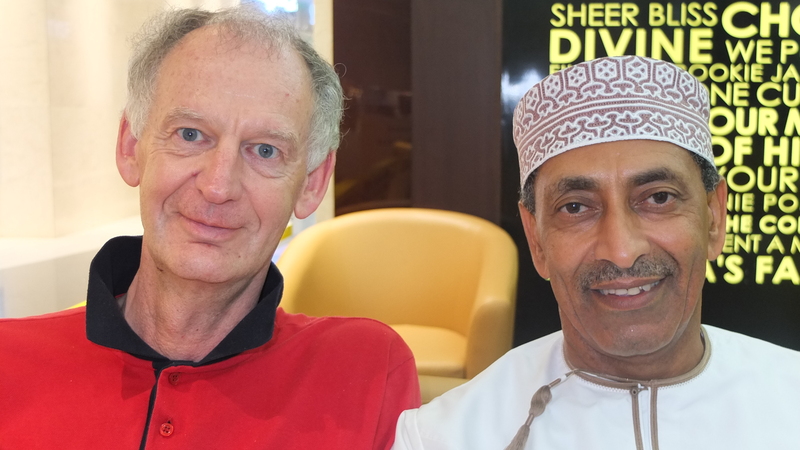 His main rival was Ibrahim Ismael Muftah, from Qatar, coached by 400 meter ex-world record holder John Smith. Muftah had beaten Mohammed during the Asian Championships in New Delhi the year before. I’ll cut a long story short: Mohammed beat Ibrahim and won the gold medal for Oman at the Asian Games. It showed the incredible mental power of Mohammed. The injury at the thigh came back and limited Mohammed during 1991, very few competitions were run, and most of the time was spent on rest and rehab. In 1992 the Olympic Games were in Barcelona, but we would not go there together anymore, even if Mohammed’s training and preparation looked good. Good enough to run under 45 seconds again. But due to problems in the Omani Athletic Association we did not receive the budget necessary to go to Spain for a training camp to escape the unbearable hear in summer, and to travel for the necessary competitions. In the end again Mohammed’s first competition in 8 months would be the heats of the Olympic games just like in 1984. The thing that was different from 1984 were the high expectations after Mohammed’s successes in the recent years. This situation was unacceptable to me, and I refused to take the blame for imminent failure and I left Oman to become the coach of an international group of athletes preparing for the Olympics: Sandra Farmer-Patrick, Juliet Cuthbert, Merlene Ottey, Winthrop Graham, Troy Douglas and others. Mohammed and the other Omani athletes did go to the Olympics in the end , but with a completely inadequate preparation, so their participation became a disaster. Mohammed, devastated by the events, became 6th in the 400 meter heats in 48.00 secs. My heart was crying because I knew these athletes deserved and could have done so much better, if only they had received the necessary support from their association. Q: Asking him about what factor separated him from the rest of the athletes, his technique, his strength, his endurance? He pointed at his head and said his mind was stronger than that of the others, his willpower, his capability to continue where others gave up. And having been his coach I support this for 100%. It was impossible to make him give up a work-out, he always found some “hidden energy reserves” to do another run. Q: Could he have run under 44.00 seconds? Mohammed thinks he could have done that if only he would have had more scientific and medical support e.g. to prevent and cure injuries and, as indicated above, the necessary support from the Association in order to prepare him adequately at world-class level. Q: What were the positive things about his career as an athlete? The opportunity to travel abroad, to see other countries and to meet other people and other cultures. He did however not enjoy to stay away from home for extended periods of time such as training camps for weeks or months at an end. Mohammed still follows athletics, mainly on TV and the Internet. Q: What changes did you see when you compare the current situation with time you were active? Of course better conditions, in Oman athletes have a car and are no longer picked up by the bus. In the first years of his career Mohammed worked as a taxi driver in the morning, went to train in the afternoon, and in the evening he had second job at the national TV station. More facilities are available, such as synthetic tracks, but the accessibility is too limited, the track should be open for every athlete at any time. Q: What needs to be improved in Oman in order to create another Al Malki? Mainly the Association, it looks as if the Association is mainly supporting themselves instead of the athletes, the coaches and the sport. They need to invest in good coaches with a proven track record. In general: the Association and the Olympic Committee invest and employ in people who never performed anything in sport. Q: What would his advice be for young athletes?